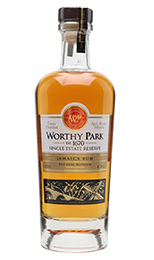 An authentic and traditional Jamaican rum and our first release under our Worthy Park range of bottling’s. A blend of our 100% copper pot-still rums that have been aging between 6-10 years; this blend has been created to showcase the unique complexity and distinctive taste that Worthy Park has to offer. 100% single estate product; batch distilled, aged, blended and bottled on site. Tasting Notes: A natural, light amber color; the nose is punchy with upfront aromas of light tobacco and toasted oak with spicy fruit – raisins and plums. With time light notes of vanilla become evident. On the mouth luscious and tropical fruits with a soft, buttery and almost creamy texture. Dry a slightly bitter, soft tannins are rounded out by toasted oak and nutmeg. A hint of black pepper finished off with a touch of ginger as it lingers with it’s soft, dry finish.